Michelle Ngirbabul is a proud native of Saipan, the largest island in the U.S. territory of the Northern Mariana Islands. 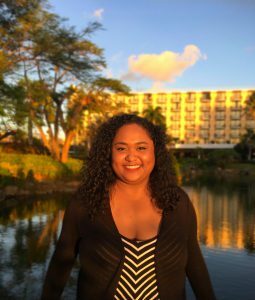 She lived on Saipan until she moved to Cornell College in Mount Vernon, Iowa to pursue her undergraduate career as a Gates Millennium Scholar. While there, she discovered her passion for global health and international development. Inspired by her time at Howard University as a 2014 Rangel Scholar, she created her own individualized major in Global Health and pursued research opportunities in Vietnam, South Africa, Argentina, and India. As a 2015 Ralph Bunche Scholar at Duke University, Michelle researched the effect of health-specific aid on aid-recipient countries’ gender equity scores. She presented her work at the 2015 American Political Science Association’s annual conference in San Francisco and at the University of Michigan’s Emerging Scholars Conference in Ann Arbor. After graduating in 2016, Michelle completed a nine-month public health internship in rural Maharashtra, India. Most recently, Michelle lived in Mumbai for one year where she studied Marathi under a Critical Language Enhancement Award for three months. She spent her remaining time conducting public health research on anemia as a Fulbright-Nehru Student Researcher. Her project evaluated urban and rural iron supplement compliance among young women in Maharashtra and explored the role of poverty and food insecurity in nutrition-related diseases like anemia. Michelle will pursue a Master of Public Health in Global Health. She is honored to be a Payne Fellow and is inspired by the late Congressman Payne’s work in global health and foreign affairs. She hopes to continue Congressman Payne’s legacy and to increase the visibility of Pacific Islander Americans at home and abroad while advancing U.S. foreign interests as a USAID Health Officer.